Why Is Installation Of Your Replacement Custom Windows Important? Windows are moving mechanical parts of your home, but also have a great impact on your home’s appearance, safety and comfort. 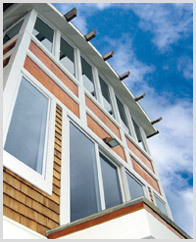 Especially if you are considering custom windows, their design, installation, any adjustments are best done by an expert. Ask a reputable window retailer and they’ll admit, the majority of major window problems are the result of incorrect installation. Windows are part of the “building envelope.” They keep out weather, intruders, insects, and wildlife. Windows contribute to the comfort of your home, and choosing the right ones can even help you harness solar warmth in the winter months to help lower energy costs. Improperly installed windows may do a poor job of keeping out drafts, rain and condensation, actually channeling water in, instead of away. This can lead to damage that goes beyond the windows, into walls and load bearing parts of your home. Incorrectly installed windows can become impossible to open, a serious concern considering they are your family’s escape route in the event of fire. You’ll appreciate windows that open freely, allowing in fresh air to keep your home healthy. Window installers with decades of experience have dealt with all of these issues. They have extensive training in how to prevent trouble, and chances are they’ve corrected bad installations dozens of times. An experienced company of window specialists is skilled in the many areas that ensure the success of a window replacement project: engineering, proper building and construction techniques, and the art of architecture, to name a few. Only companies that focus on designing and installing windows offer this depth and variety of skills.